Blog entry for a Half Share of MONTY DELUXE — Week B. Pick up date: May 12, 2014 — Week 2 of Summer ’14! The half share means I only pick up every other week. 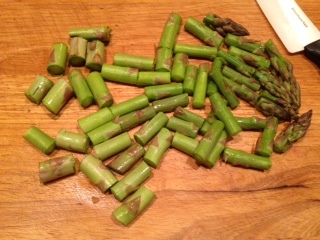 The Summer always starts a bit light, as things are just beginning to grow after the long winter, so we only got one veggie this week: Asparagus! However, it was amazing, and I am still trying to finish it. 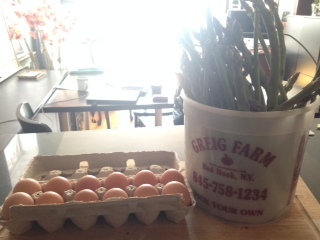 We got a huge bucket of asparagus — 3 & 1/2 pounds!! 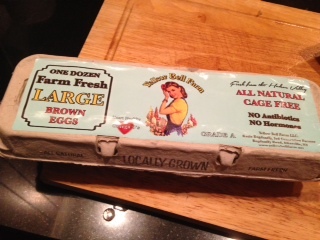 — from Grieg Farm, and I got a dozen eggs from Yellow Bell Farm. 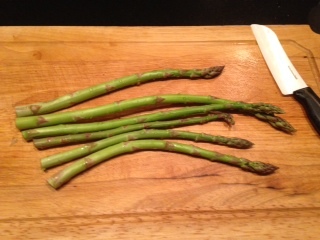 Breakfast: For one serving, I tend to just cut 6 stalks or so, chopping them in bit sizes, and never over cooking (lightly brown/singed, still crispy) – to retain the nutrients and flavor. I am a terrible cook!! Luckily, the food from CSA is so amazing, you don’t have to do much to enjoy the hell out of it. 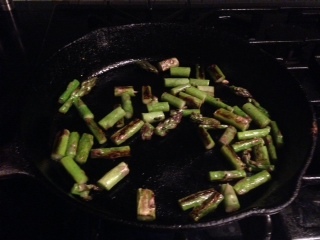 I love my iron skillet, and pretty much throw everything in here, keeping it simple: sautéed asparagus with Toasted Sesame Seed oil, and adding a bit of Sea Salt. 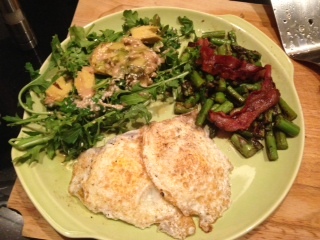 Once the asparagus was done, I threw one piece of bacon in the pan & fried up a couple of the eggs in the bacon grease. Then made an arugula salad with 1/2 avocado, sesame seeds & with tahini/lime/toasted sesame oil dressing — add a cup of coffee & you got a great breakfast! It took about 10/15 minutes to make. Fast and simple. See you around in B week!